I came across an interesting definition of magic the other day: “effects without causes”. Which has got me thinking. You see, I’ve tentatively started another novel (just 3,000 words so far), and I’ve decided I want it to be a proper fantasy – not set in the real world, but in a wholly fictitious world, as you’d expect from a fantasy novel. Now, one of the key elements of a fantasy story is magic. This ranges from the tantalisingly low key (Gandalf in Lord of the Rings using his staff like an electric torch or setting pine cones on fire to drop onto prowling wolves) to the rather overdone (Steven Erikson’s mages operating in barrages like heavy artillery in World War 1). In fact, I think one of the most appealing aspects of the Lord of the Rings – and one that few of its imitators have taken on board – is that magic is at its most magical when it is used sparingly. So anyway, my challenge to myself is to come up with a form of “magic” that I can justify in terms of what I know about about the way our universe works (pretty limited, actually, based almost entirely on Brian Cox’s “Wonders of the Universe” but with a less bombastic soundtrack). But which is still magical. I decreased at a rate of 2 stitches every 6 rows all the way down the sleeve (one stitch either side of the seam), so I was left with 118 stitches immediately before the cuff. I decreased that by 10 stitches (approximately 10% of the total) to 108. The advantage of 108 is that it is divisible by 4, so it gives me exactly 28 ribs in the cuff (each rib consisting of 4 stitches in the usual way, k-k-p-p). 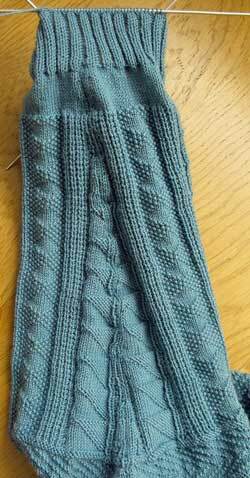 As is my custom these days, I shall – eheu – knit a 6-inch cuff, so the wearer can adjust the length to suit (and on cold days can unroll it all the way down to make a sort of fingerless mitten). 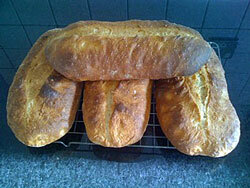 This weeks’ bread is Richard Bertinet’s Ale and Yeast bread. Basically, you replace some of the water with ale (or in my case, Mexican beer) and the result is a nice, yeasty, slightly bitter tasting bread which is particularly toothsome dunked in a hearty soup. And you get to drink the rest of the beer after – it’s a win-win! Going back to magic, I think there’s something interesting too in the thought that we seem to have a particular hunger for marvels – look at the success of Harry Potter, fantasy in general, and even “magic realism” in literary fiction; and yet when you think about it, we actually live in an age of marvels – iPads, iPods, digital cameras, even the fact that you are reading this now – all of which were, I guess, fantasy when I was growing up. So why aren’t we satisfied? What are we missing? Personally, I love to read books about magic in the real world. I cannot empathize with the characters as much if they are in fantasy land. I never was much of a (okay dont burn me at the stake) Lord of the Rings fan. I love Jim Butcher’s Harry Dresden series set in current Chicago because even though he uses his different “weapons” these are all focus amplifiers, if you will, of all the magic that is channeled from his inner core. So in reality, the magic come from his very soul. Soul magic I think is an interesting concept. I love Harry too because he is such a wiseacre. Harry is just the best. I just cant get into Butcher’s Codex Alera series. I just find this fantasy genre boring; maybe it is my feeble brain. Have you read A Discovery of Witches? A little verbose for my taste, but very heavy on the renaissance (an I use that in the generic sense as I am not sure of the exact times) classical authors and philosophers, heavy on alchemical philosophy. The sweater of course is beautiful, so is the bread. It’s all a question of taste, isn’t it? I’d like to enjoy trad fantasy more, but like science fiction I find a lot of it hard to get into. The modern trend is to throw the reader in at the deep end, with no frame of reference, and I can only take so much of that. 2. Shogun: Many years since I read it, but GREAT book! 3. Book Harry and TV Harry are like comparing gruel to ambrosia! 4. I “read” Discovery of Witches after downloading CDs from my library onto my itty-bitty IPod. Coincidence – I am just now re-reading The Hobbit to get familiar with the characters again before the movie comes out sometime in 2012, and just finished the scene you quoted with Gandolf, his staff, and the wolves. The gansey is looking great, I’m about a month behind you with mine (but my calluses are peeling almost daily !) Anxiously awaiting the steeking process! Tom Shippey, in his splendid book “Tolkien Author of the Century”, points out that many of the names of places in The Hobbit are just nouns – The Hill, The Shire, The Carrick, The Misty Mountains, The Lonely Mountain, Mirkwood, Laketown, etc. – whereas LOTR is bursting with languages and names. Curiously I think the lack of names in The Hobbit adds to its strangeness. I’m going to slow down soon – I’ve got a job application to write, a visit to my parents in the Midlands to make, and Easter. So you’ll have a chance to make up some time! “‘Twas brillig, and the slithy toves…” – Lewis Carroll was pretty good for fantasy though I have to admit a fondness for Tolkein and Marion Zimmer Bradley’s Darkover stuff. 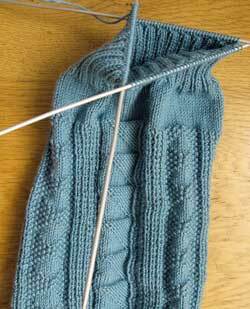 I’ve taken on a commission for a scarf – gansey of course but a narrow one. Darn it all anyway – I have to frog about 4 rows! Thanks the gods I chart meticulously! The sweater’s looking great. I wait with bated breath for your weekly updates as I’m trying to screw up my courage to knit a sweater myself. The video is great. I’ve never been sure how to pick up stitches at the edges of things so your first one is timely. Thanks! I look forward to more. Have you seen Terry Gilliam’s utterly strange misfire of a movie “Jabberwocky”? I have a deep affection for it, even though it doesn’t quite work – mostly I think because the Monty Python acting style of Michael Palin doesn’t work when thrown into scenes against experienced veteran actors. But it’s visually quite stunning, and of course the jousting bloodbath is always good for a laugh! Glad you enjoyed the video clip – I’m working up my courage to record them with voiceovers. Good luck with the scarf – frogging and all…! I’m a Python fan but haven’t seen “Jabberwocky” – I’ll have to “youtube” it! Thanks. Sorry that I can’t contribute on the fantasy/magic discussion. I’m not much of a reader, and when I do read, it’s generally history or how-to. Couldn’t agree more. 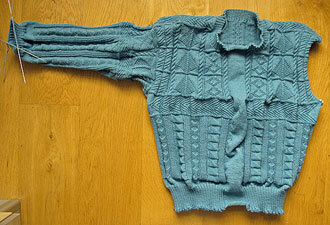 I’ve never – and I mean, never – knit anything other than ganseys. Not even a scarf (I don’t know how). (This lack of curiosity and exploration may also help explain why I don’t get invited to many parties.) To me, the only intimidating thing about knitting a gansey is the scale of the project, the length of time to complete it with all those little stitches. And if this blog has taught me one thing, it’s that it’s amazing how quickly you do progress. In fact I’d recommend anyone tackling a project like this to take baby pictures every week, so they can amaze themselves looking back at how much they’ve done – even if it doesn’t feel like it. I enjoy reading history occasionally – I’ve a bit of a thing for the middle ages and the American Civil War, for some reason. Have you watched any of the Lord of the Rings movies or Harry Potter? Or Star Wars? I’ve read the Harry Potter and Lord of the Rings books, and watched those movies along with the Star Wars saga. I enjoy them as action/adventure, but any symbolism that they may contain is lost on me. Don’t worry, I don’t watch Star Wars or Harry Potter for the symbolism! But Lord of the Rings repays study, mainly because Tolkien was a master of ancient languages and sagas and the roots of his inspiration often throw light on what he wrote – for example, did you know that Tolkien chose the name of the dragon in the Hobbit, Smaug, from “smugan”, an Old Germanic word meaning “to squeeze through a hole” (which Tolkien referred to as a “low philological jest”)? He didn’t create great female characters, on the whole, but he certainly knew his languages! I read English lit for my first Bachelor’s degree. Tolkien edited a version of Sir Gawain and the Green Knight that’s a neat read in Middle English or the modern English version. If you can get your hands on either version (depending on your tenacity among other things for the Middle English version)it’s one I’d recommend. I haven’t tried the Gawain and the Green Knight version by “Tollers” (as I like to think of Tolkien, after discovering that was what CS Lewis called him), thanks. I’m not well versed in Middle English literature (I skip from the Anglo Saxons period to the 19th century!). But I love the story. I’m not a big fan of his music, but I was quite excited when I discovered the modernist composer Harrison Birtwistle had created an opera out of it. But imagine my dismay when I discovered that, not only was the music ugly and rebarbative (which I expected), but he’d changed the ending, so Gawain is revealed as a coward and a liar (thus undermining the poem’s superficial ideas of heroism, etc. etc.) and has to live with this for the rest of his life. Talk about a downbeat ending! I have read a series of books by an author named Tamora Pierce who writes young adult novels. The series is about youngsters finding their abilities for magic through everday sklls such as gardening and spinning/weaving as well as other “mundane” activities. You could use your skill in knitting Ganseys as the foundation of the magic abilities in a character of your proposed book “A Stitch in Time”! I have just this week found your website, and I’m absolutely entranced by your knittng, breadmaking, and sense of humor! I sure would like to hear more from Margaret, unless she has her own site. Then I’d be interested in the URL for hers as well! How nice to hear from you. I hope you continue to tune in and find it useful. Margaret is the knowledgeable one, but prefers to keep a low profile, like some nocturnal mammal during the tim of the dinosaurs. I think she’s wrong, but she feels she expresses herself best with her hands, not with words like me. I did once think of a story where the characters could magically transport themselves to a place resembling the pattern on their gansey – eg a forest for the trees motif, or a castle with flags, etc. One of these days I will write a magical ganseys book of short stories – maybe for Christmas!